Eat The Street is a very new event to Honolulu. 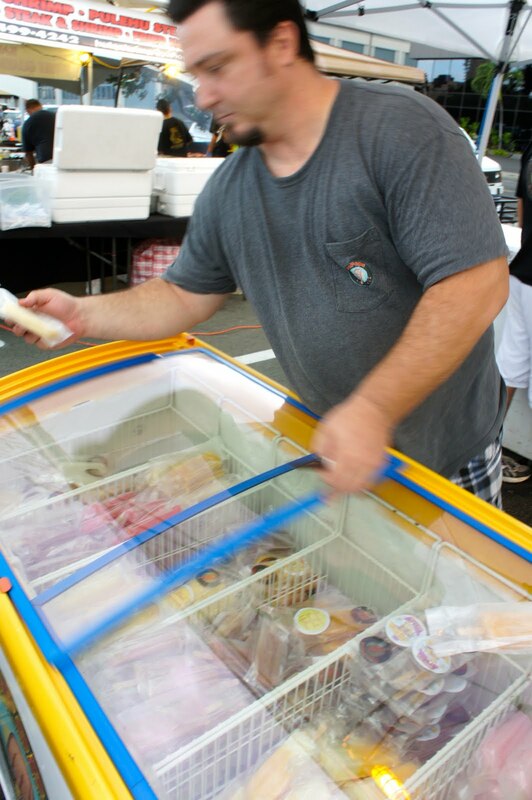 Lately, food trucks have become a popular staple in neighborhoods all across the country. And, it isn't your usual unhealthy plate lunch-type food; many trucks are now specializing in healthy, gourmet food items to choose from. It has become such a big event in Honolulu, and every month, Eat The Street includes more and more new trucks! This is only the 4th Eat The Street! 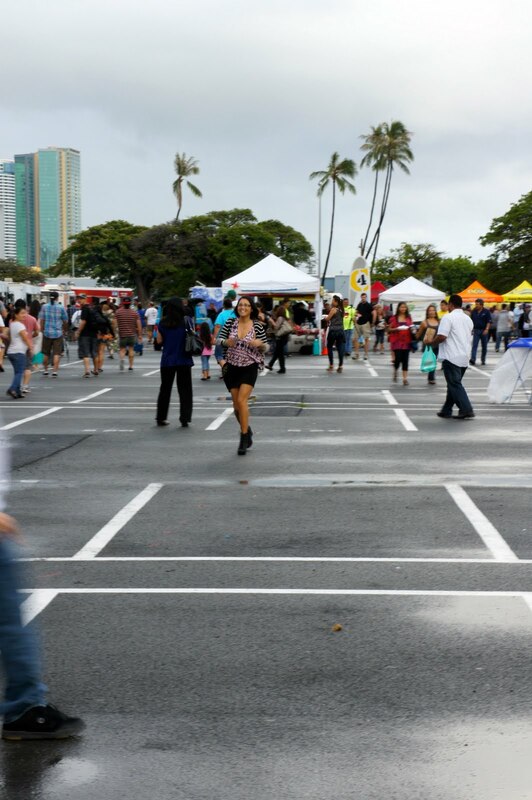 And don't worry if you missed April's Eat The Street, Street Grindz and Nonstop Honolulu will be hosting Eat The Street every last Friday of the month. 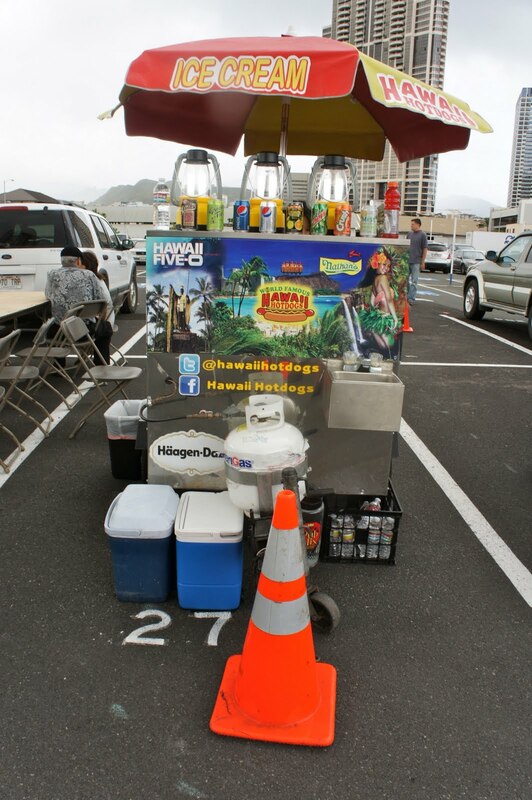 It is located in a big empty parking lot on 555 South King Street in Kaka'ako, and starts around 4pm and goes til 9pm! Come early for onsite or street parking. My friend and I hurried over around 4pm to get some good parking. (I still need to find out if you can park inside the lot, as there was a lot. We were unsure if you needed a pass. I'll find out more info.) If you want to get close parking as well as not have to wait in the lines for 2 hours, your best bet is to come when it starts. Although we got rained out, it cleared up later on in the day. It was still a great event, and even better, there were no lines! Earlier in the day around 430pm- not too crowed, but a fair amount of people checking it out! Cool food truck by Chimney Cakes! Fairy Cakes specializing in cupcakes! They were oh-so yummy and moist! Try the Banana one! You definitely have to try one of these! Yes, in honor of the Spam Jam, two pops were invented for this: Saimin flavor and Spam flavor!! Ume Thai Basil to L, and Kalamansi Coriander to the R.
The Kalamansi Coriander was very citrus-y and refreshing! One of my favorites. Ume Thai Basil tasted exactly like Ume and Basil. It was salty! 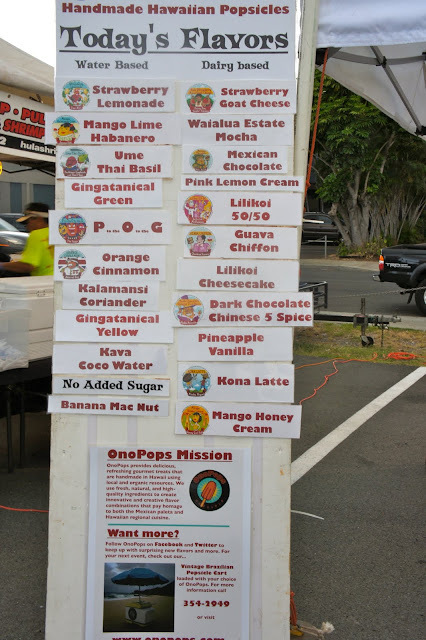 Stopped by Whole Foods Kahala after to see what flavors they had. Caramel Shoyu seemed like the most popular with only 3 left in the freezer, so I tried it! 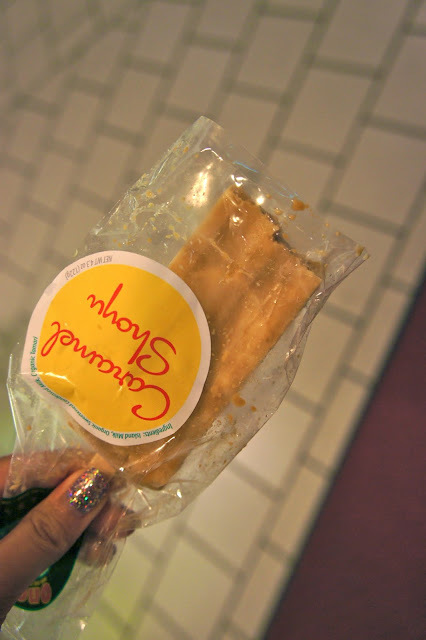 It tasted more like a toffee; a salty caramel flavor. 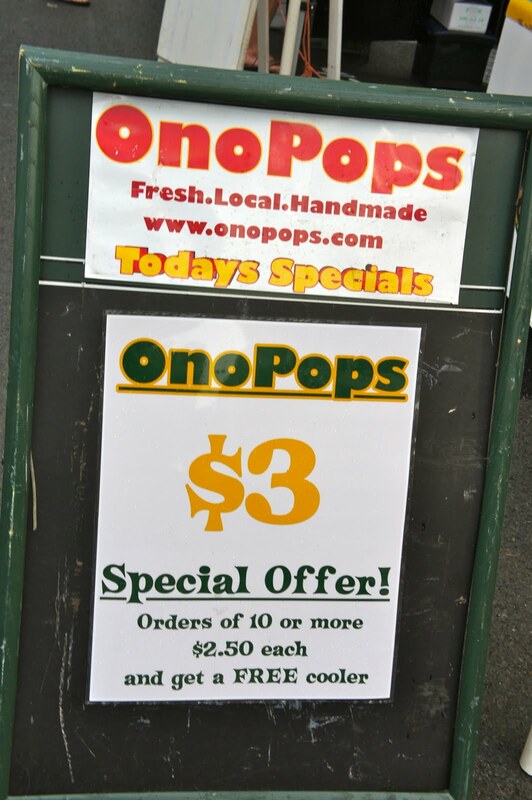 Stop by onopops.com to see different retailers that sell Ono Pops around the island! What I had come for- MALASADA BURGERS?! Sweet tea and Crab Mac n Cheese! Stacy's Hawaiian Food Spicy Ahi Poke and Rice! Lots of bite, people! Beware! 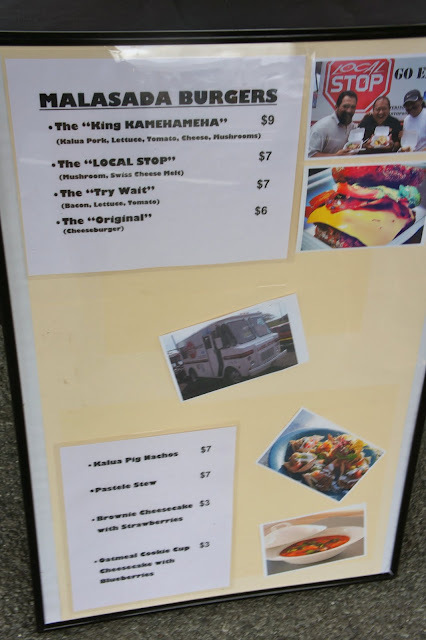 The King Kamehameha Burger features Kalua Pig, and The "Try Wait" which is a BLT. The King Kamehameha- sweet and salty all in one! SO GOOD. Red AND Blue Velvet Cupcakes from Koi! Playing the "Gimme Gimme" Game! Announcer asks contestants to find certain items. The girl next to me sprints off! The announcer asks for a takeout menu from one of the trucks...I have one in my hand from Koi! Dumbfounded by the takeout menu in my hand, the announcer jokingly asks what else I have in my bag!! The small kid brings back one of the trucks main menu!! 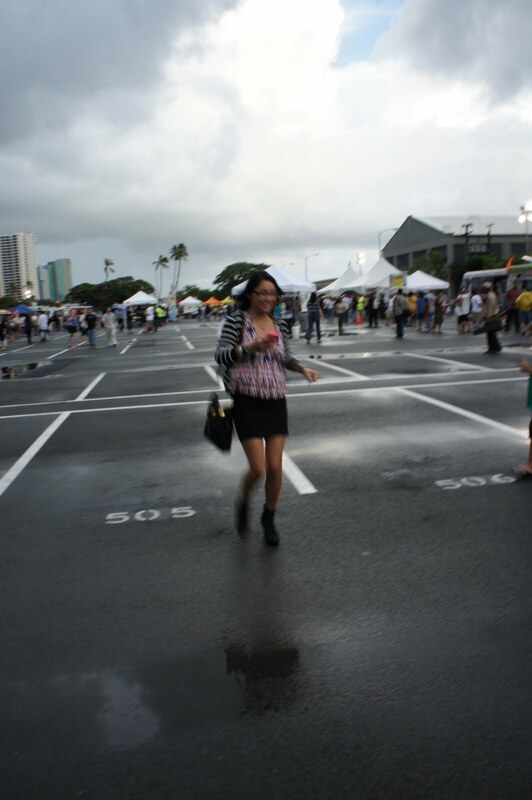 Off to get something from the Nonstop Honolulu booth! Back with a Nonstop business card! all the way on the other side of the parking lot. My competitor sprints off....as usual. Me, I jog 1/4 of the way, zoom with my iphone, and get a pic. I walk back...and win. Meanwhile, the other girl is sprinting back with her pic. I won a Geiko Tshirt and free Movie Passes! Before we left and to cool down from all my running, I got another Ono Pop! 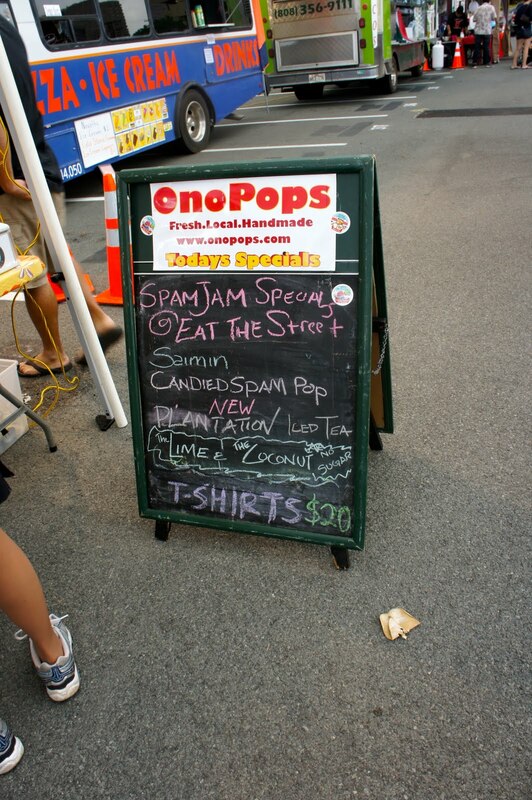 Remember to get one of these to get special discounts at the next Eat The Street event! 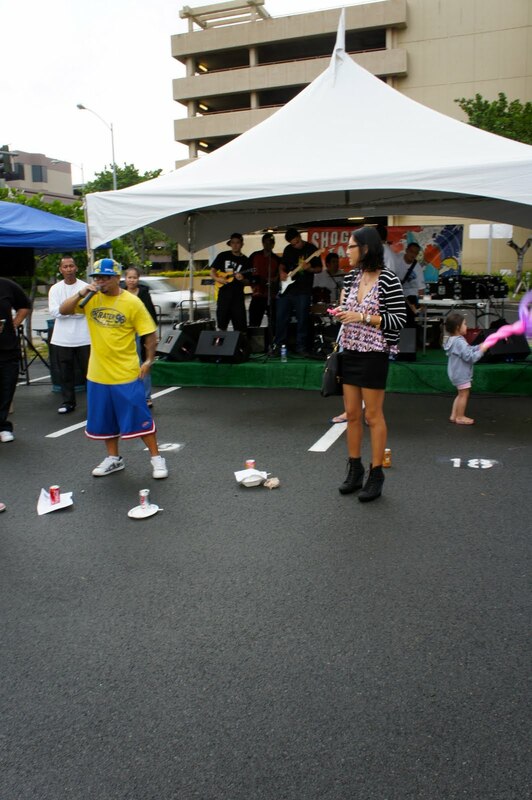 Come to enjoy all the food and entertainment at the next Eat The Street event next month! very right very right. that's exactly how i felt before i experienced Eat the Street! but then again, if you go, you get them all in one place and can eat your way through the trucks! this one was especially great bc although it was a bit cloudy and rainy, not many people came, so there were hardly any lines! if you could battle the pouring rain for a good 5-10 minutes, then you were good to go for the rest of the event! gotta go next time!! next month, last friday.